Jharkhand SSC Driver Answer Key Check Here. Jharkhand SSC Driver Admit Card Check Here. Jharkhand SSC Notification is out. Jharkhand SSC is recruiting for 84 Driver Govt Jobs Posts. You can check Jharkhand SSC - Jharkhand Staff Selection Commission last date, download Jharkhand SSC notification, visit Jharkhand SSC official website and check other Jharkhand SSC Vacancy details.Complete Vacancy and recruitment Details about 84 Driver Govt Jobs vacancies in Jharkhand SSC are provided below by JobSarkari.Com only for you. Last Date for Apply Online 16/11/2018. Vehicle Driver(HMV) Candidate Must Have Passed Class 10th and Posses HMV Driving Licence With knowledge of Traffic Rule & Vehicle Repairing. 06 01 01 03 11. Vehicle Driver (LMV) Candidate Must Have Passed Class 10th and Posses LMV Driving Licence With knowledge of Traffic Rule & Vehicle Repairing. 37 06 07 19 73. Total No of Post 43 07 08 22 84. Age Relaxation Upper Age Limit is Relaxable by 02 Years for OBC and 05 years for SC / ST Candidates. 6.Online Application Can be Submitted on or before 16th November 2018. Q. 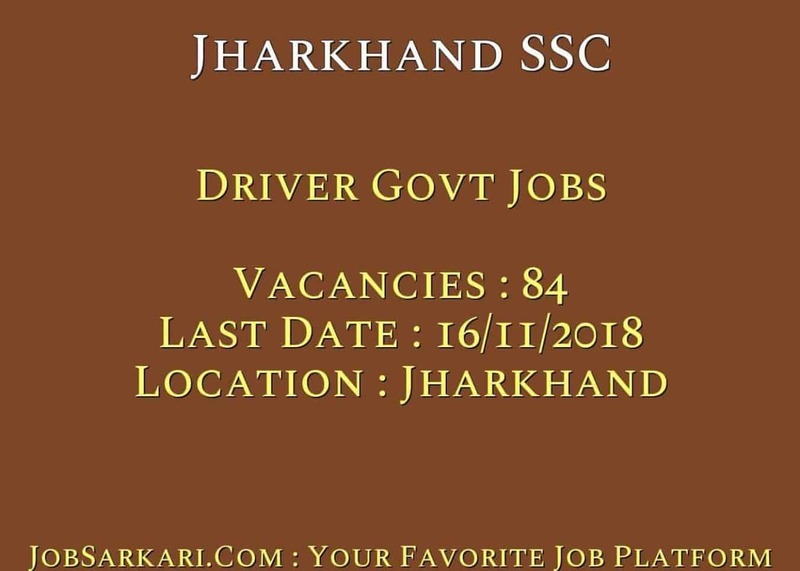 What is the Last Date For Jharkhand SSC Driver Govt Jobs Vacancy ? A. 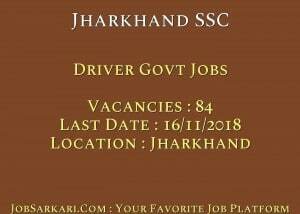 Last Date for Jharkhand SSC Driver Govt Jobs Posts is 16/11/2018. Q. What is the Form Type of Jharkhand SSC Driver Govt Jobs Recruitment ? A. The Form Type for Jharkhand SSC Driver Govt Jobs Posts is Online. Q. How many vacancies are available in Jharkhand Staff Selection Commission Driver Govt Jobs Posts ? A. There are about 84 Vacancies in Jharkhand Staff Selection Commission Driver Govt Jobs Posts. Q. What is the Full Form of Jharkhand SSC ? A. Full Form of Jharkhand SSC is Jharkhand Staff Selection Commission .